Whichever way you look at it bringing life into this world is an empowering occasion all on its own. However, all too often parents spend more time looking into what TV, car or any other item they want to buy, than they spend preparing themselves for one of life’s most altering events. There are some simple yet important steps a woman and her partner can take to prepare for that life changing moment. An important decision is choosing the right care provider, if she wants one. Women can chose between an OB, a hospital midwife, or a homebirth/birth center midwife, or an unassisted birth. In large part the care provider she chooses will determine the type of care she will receive because of how they are trained to see or deal with birth. In short, an OB is great for high risk pregnancies, a midwife is great for a woman with a low risk pregnancy, a home birth with a midwife is good for a low risk pregnancy in which the woman feels that home is where she wants to birth, and an unassisted birth is usually chosen by women who trust birth completely and feel very educated and confident in their ability to birth. Hand in hand with what care provider to choose goes where a woman wants to give birth. All options are safe options given the right level of care and knowledge. In addition to her partner, family, or care provider, having a doula as part of the birth support team can significantly enhance her birth experience. A woman needs to be knowledgeable about pregnancy, the birth process, and her birth choices. One of the ways this can be achieved is by taking a childbirth education class. That said, not all classes were created equal. Women have many options to educate and prepare themselves for that special day; it is beneficial to research those options. Here are some options, in alphabetical order: Birthing from Within, Bradley, hospital childbirth classes, hypnosis for childbirth (Blissborn, HypnoBabies), Lamaze, and others. My personal favorite is a class that uses meditation and relaxation techniques for childbirth. This method teaches you to regain trust in yourself and the birth process and to let go of any fear or tension, allowing for a comfortable and positive birth experience. Women are often fearful of birth. 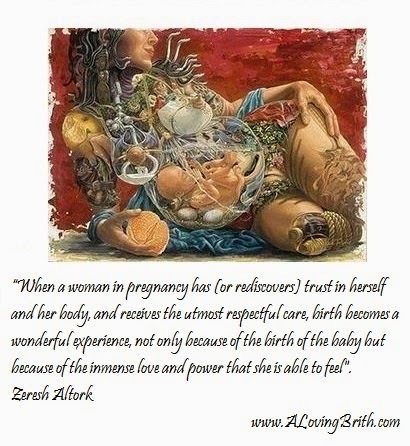 Society portrays birth as a scary event, when in reality birth is a natural, safe and marvelous process. When birth occurs with respect, and women have the right level of care, preparation, and support, they learn to let go of the fear, regain trust in themselves and their birthing ability, and embrace their experience. It is ultimately a woman’s choice of how, where, and who surrounds her when she gives birth. Therefore it is important that all women educate themselves about their choices, that they become advocates for their own birth experience, and that they surround themselves by the right support. It is essential that a woman's wishes are supported and that she feels confident in her birthing ability and her choices. That is ultimately what will help her have an empowering birth.